An 18-year-old female patient reported to the Department of Conservative and Endodontics with the chief complaint of fractured tooth with respect to 21 and increased pain and mobility tooth with respect to 22. Intraoral periapical radiograph of 21 revealed coronal loss of tooth structure involving enamel, dentin, and pulp, suggestive of split tooth with respect to 21. Intraoral examination revealed a fracture of coronal structure of 22 and increased mobility in the coronal aspect, suggestive of horizontal crown–root fracture. For management of 21, after endodontic phase, placement of fiberpost, and coronal buildup, intentional reimplantation was done to expose and reattach the vertically fractured root fragment. For management of 22, after endodontic phase, crown lengthening was done, and the fractured fragment was reattached by making it a Natural Richmond's Crown. Radiographs revealed a complete sealing of the fractured fragment and proper positioning of the tooth. Esthetic discrepancy due to fractured anterior teeth can cause psychological distress to patient more than any other functional dental inadequacy. Esthetic loss contributes majorly to this psychological distress, though the lost form and function are also major contributors. Hence, the restoration of esthetics supported by requisite form and function are required for resolving this psychological setback of fractured anterior teeth. It is challenging to save the intact split tooth, but the position of the crack and its extent apically determines the prognosis of the tooth. The prognosis of split anterior tooth is considered poor due to inability to explore and seal the fracture line completely. If the extent of fracture is deep apically (severe), the tooth must be extracted. If the extent of fracture is middle to cervical third of root (i.e., shears to a root surface and not too far apical), the smaller segment will be very mobile. Then, there is a good possibility that the small segment can be removed and the remainder of the tooth salvaged. When the fracture was deep but not till the apex, extraction of mobile fragment would have created future periodontal problems. The only viable option to salvage the tooth is of intentional reimplantation with reattachment of fractured fragment. Horizontal root fracture at the level of cervical third, the level coronal to the crest of alveolar ridge, is considered to be poor due to the presence of short mobile coronal fragment and decreased probability of healing with hard tissues and bacterial contamination of root canal from gingival crevice. 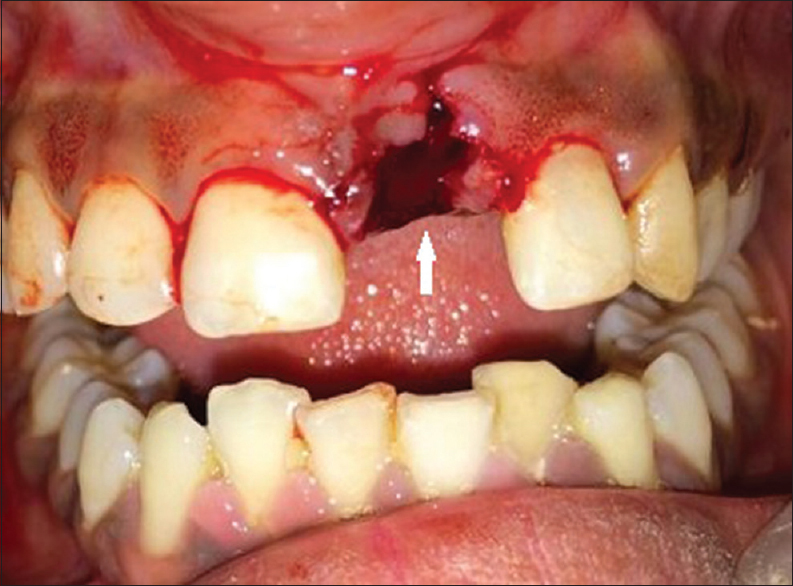 Fear of loss of anterior tooth after trauma can appear to be a nightmare to the patient. However, with the advancement in bonding systems, the chances of restoring and sealing fracture line can redeem the endangered tooth without compromising the esthetics. 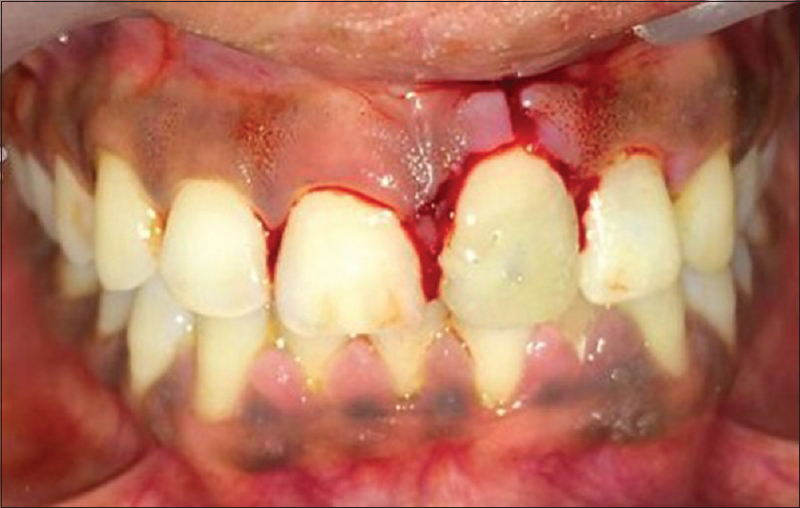 The present article is a case report about the management of two fractured teeth 21 and 22. In 21, there was a loss of coronal fragment and a vertical fracture line extended from coronal third to the middle third of the root and crown–root fracture with respect to 22 in which the horizontal fracture line was at the cervical third of crown above the level of alveolar crest region. Management of 21 was done by intentional reimplantation in which the tooth was extracted, bonded extraorally, and repositioned into the socket. Management of 22 was done by fabricating a natural Richmond's crown by placing a fiber post along with the fractured coronal tooth portion. An 18-year-old female patient reported to the Department of Conservative and Endodontics with the chief complaint of fractured tooth with respect to 21 and increased pain and mobility in 22. The patient gave a history of trauma few hours ago. Past medical and dental history were not relevant. Intraoral examination revealed split tooth with respect to 21 [Figure 1]a and [Figure 1]b. Intraoral periapical radiograph of 21 revealed coronal loss of tooth structure involving the pulp with respect to 21 [Figure 2]. Wedging test was performed to check for movement of the root segment, and the significant mobility of fractured palatal segment was seen extending below the cementoenamel junction. 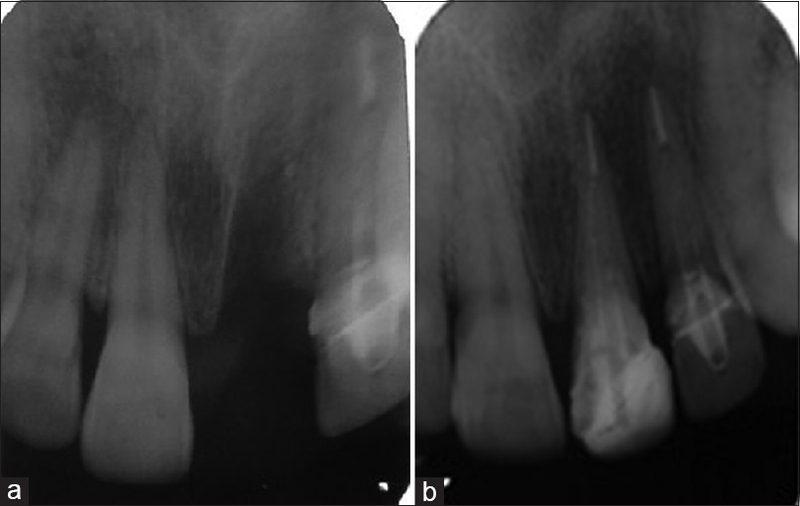 Intraoral examination revealed a horizontal fracture of coronal structure of 22 and increased mobility in the coronal aspect suggesting crown–root fracture [Figure 1]a and [Figure 1]b. 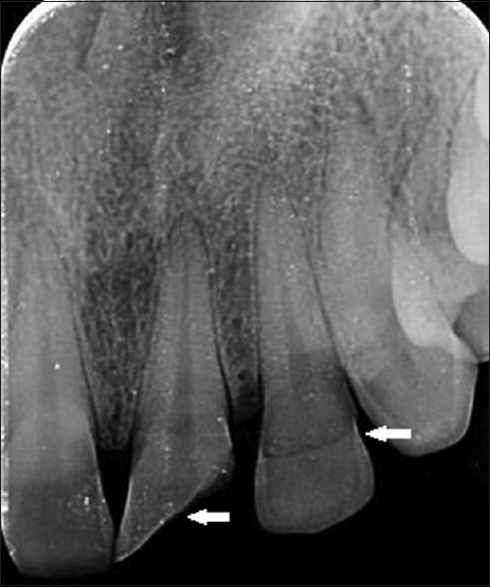 An intraoral periapical radiograph revealed a thin radiolucent line in the cervical third of crown above the level of alveolar crest region, suggestive of horizontal crown–root fracture [Figure 2]. On clinical examination, the coronal part had increased mobility, and blood tinge around the fracture line could be appreciated. For the management of 21, the fractured line was assessed for locating the extent of fracture. Under local anesthesia, access cavity was prepared, and complete root canal treatment was performed. Postspace was prepared by drill number 1 (para post system), and fiber post was placed irt21. 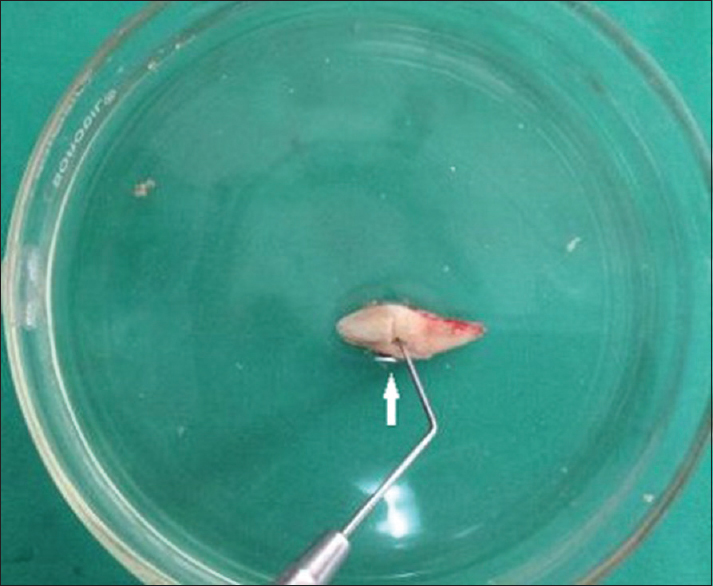 The complete tooth was extracted and stored in Hanks' balanced salt solution, and the extent of fracture was located [Figure 3]a, [Figure 3]b and [Figure 4]. The fragment was then reattached with the help of dual-cure resin (Multilink Automix, Ivoclar). The whole unit was repositioned into the socket in 15:03 min. 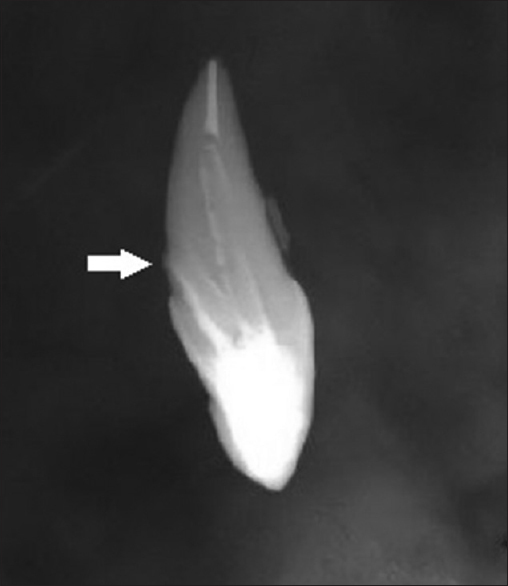 The tooth was stabilized with the help of a fiber splint (Interlig, Angelus) and composite for 4 weeks [Figure 5], [Figure 6], [Figure 7]. Under local anesthesia, crown lengthening was done tooth with respect to 22 for exposure of the fractured site, and then the fractured fragment was extracted, cleaned, and stored in normal saline solution, [Figure 8]a, [Figure 8]b, [Figure 8]c, the pulp was extirpated, working length was determined, cleaning and shaping was done followed by obturation. Postspace was prepared, and the coronal fragment was modified to attach the fiber post. The fractured fragment was etched by 37% phosphoric acid, bonding agent was applied and cured, and the fiber post was attached to the coronal fragment using a resin lute making it “a Natural Richmond's Crown” [Figure 9]a, [Figure 9]b, [Figure 9]c. The complete unit was then repositioned and reattached to the radicular portion by dual-cure resin (Multilink Automix; Ivoclar) [Figure 10]a, [Figure 10]b [Table 1] and [Figure 11]. Many clinical studies have professed the successful treatment of crown–root fractures., Literature reviews based on the location of fracture line and various treatment modalities have been explained which include orthodontic extrusion and surgical extrusion when the fracture line is below the crest of bone., If the fracture line is above the crest of bone height and above marginal gingiva, treatment modalities include placing a chamfer at the fracture line, using V-shaped enamel notch, placing an internal groove for reattachment. In the present case, the fracture line was above the alveolar crest, so crown lengthening and exposure of fractured site was preferred. Reattachment must be selected as the first choice of treatment when the fracture fragment is available., The major advantages of this treatment approach include regaining the color and size of the original tooth, being worn away in similar proportion to adjacent tooth, giving positive psychological response to the patient, and being economical., 21 presented with lost coronal fragment and a complicating vertical root fracture. The exposure of fractured site tooth with respect to 21 was difficult, which was compromising the prognosis of the tooth. Various treatment options could be surgical crown lengthening to expose the fracture extent and bonding of the root portion and exploratory surgery followed by bonding of the fractured fragment. Surgical crown lengthening could compromise the crown–root ratio, so this treatment option was not considered. Exploratory surgery was not preferred as the trauma was recent with no evident bone loss, and additional osteotomy would have been done to appreciate the fractured site. Hence, a third treatment modality of intentional reimplantation of 21 was selected. Intentional reimplantation allowed a better visibility of the fractured segment and a better field for bonding. In dental reimplantation procedure, there is usually a risk of root resorption and inflammatory resorbtion. It is important to point out that the presence of an intact and feasible periodontal ligament on the root surface is a key factor to secure the healing of the periodontal ligament with no root resorption. Taking care about the extraction being atraumatic, control of extraalveolar time, and the absence of contamination, these risks of root resorption are remote. After atraumatic extraction, the tooth was immediately stored in Hank's balanced salt solution, and the fractured fragment was repositioned and bonded with Multilink Automix (Ivoclar) in 15 min of extraoral time. Minimal exposure to the environment decreases further risk of ankylosis. In this case, there was a complicated fracture tooth with respect to 22, and the fracture line was above alveolar crest; hence, the pulp chamber could be used as an internal reinforcement. The use of post increases retention and distributes the stress along the root. Glass fiber post provides both the advantage of esthetics and excellent bonding. Using the fiber post with the resin cement, monobloc effect is produced which also increases the retention of the segment. Further development of the adhesive material adds a horizon in the reconstruction of fractured teeth. In the present case, “Multilink Automix (Ivoclar)” was used as it has a high bond strength of 21 ± 2 MPa in comparison to other luting agents such as glass ionomer cement, 4.76 ± 0.37MPA. Furthermore, the microleakage of resin cement is much less in comparison to glass ionomer cement (GIC). 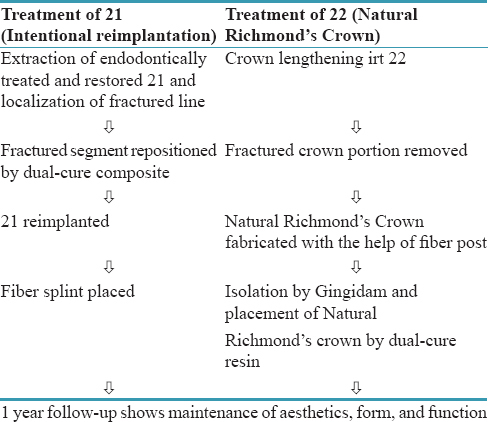 Various treatment strategies have been followed to manage crown–root fractures, but the preservation of natural esthetics remains incomparable to all other adjunctive treatments. I want to acknowledge the trustees of Institute of Dental Sciences, Bareilly, for providing me the facility to perform this case. Rivera E, Walton R. Detection and Treatment of Various Longitudinal Tooth Fractures Endodontics. Cracking the Cracked Tooth Code. Colleagues for Excellence Summer; 2008. Sharma A. Dentoalveolar injuries classification-management-biological consequences. J Dent Health Oral Disord Ther 2014;1:1-6. Yilmaz Y, Zehir C, Eyuboglu O, Belduz N. Evaluation of success in the reattachment of coronal fractures. Dent Traumatol 2008;24:151-8. 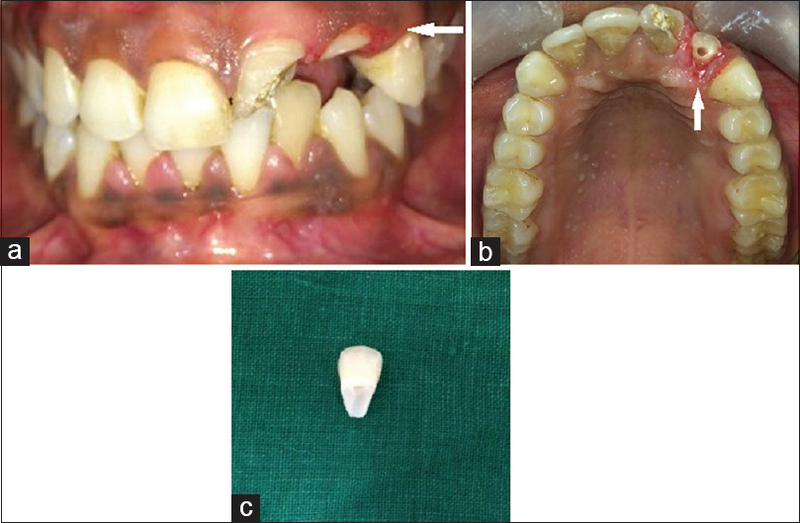 Jayadev M, Karunakar P, Solomon R, Shravani G. An ultra-conservative approach of treating coronal tooth fragment: Reattachment case reports. OHDM 2015;14:140-4. Holan G, Shmueli Y. Knowledge of physicians in hospital emergency rooms in israel on their role in cases of avulsion of permanent incisors. Int J Paediatr Dent 2003;13:13-9. Villat C, Machtou P, Naulin-Ifi C. Multidisciplinary approach to the immediate esthetic repair and long-term treatment of an oblique crown-root fracture. Dent Traumatol 2004;20:56-60. Belchema A. Reattachment of fractured permanent incisors in school children (review). J IMAB Ann Proc 2008;2:97-100. Bittencourt G, de Almeida F, Roldi A. 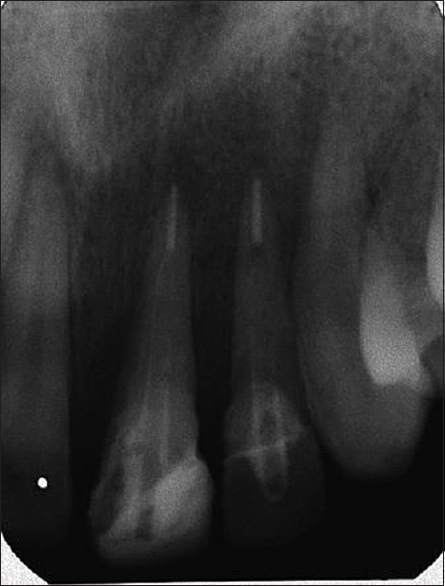 Intentional replantation with tooth rotation as indication for treatment of crown-root fractures. Braz J Dent Traumatol 2009;1:2-6. Tay FR, Pashley DH. 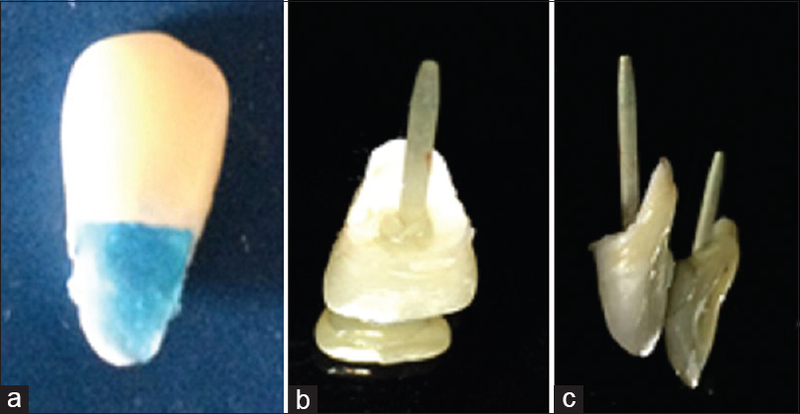 Monoblocks in root canals: A hypothetical or a tangible goal. J Endod 2007;33:391-8. Scientific Documentation Multilink Automix. Ivoclar vivadent. p. 1-23.